Shads are my favourite deep-water piking lures. In Winter, small shads and swimbaits around the 4″ mark are my first line of attack. They will also work at other times of the year when the pike are lying up, staying low, avoiding bright sunshine or basically just having a snooze. 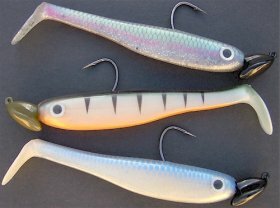 In the warmer months, I’ll use larger swimbaits to reflect their larger diet intake. Fishing them is much the same though. Here are 5 ways to get you started. The first way I fish them is to simply cast them out and let the hit the bottom, counting down as I go. Take a second or two off your count and you’ll be fishing close to the bottom. Simply wind your bait in, varying your speed as you go, adding a little dart, hang or pause but basically, it’s a straight retrieve. Dead easy. If that doesn’t work, I’ll get my lure down same as before but this time, I want to fish the lure sink and draw style. Allowing the bait to rise and fall in the water column, gives you a good chance of attracting the attentions of a fish, no matter what depth they’re sitting at, so try to make that lure seen at all depths and remember to throw those odd little moves into the retrieve. If I’m absolutely sure the fish are hard on the bottom, I’ll take the belly treble off altogether and gang the treble onto the back single or/and use a stinger arrangement. This allows me to put my bait right on the bottom without too much fear of finding a snag. Once you’ve cast out, hold the rod up high, tighten up and simply give your reel handle a crank, two cranks or three cranks and let it hit the bottom again. Keep a tight line all the time, as pike will often flare their gills and literally inhale your lure right off the bottom while it’s motionless. You can allow your bait to pause for a few seconds. Repeat the cranking action again and basically what you’re trying to do is hop your bait along the bottom, kicking up muck, detritus and hopefully create a little sound too. 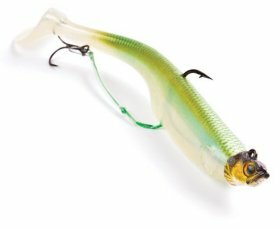 If you’re drifting over deep water, you can jig swimbaits along the bottom, using the drift of the boat to provide the lure’s forward motion. All you’re doing is giving the lure it’s up and down motion. This is probably the laziest action but it can be very effective. 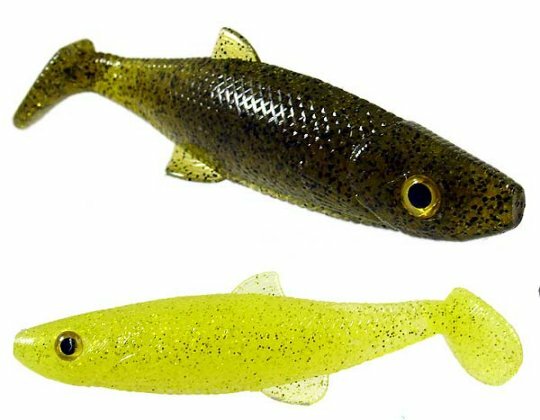 By taking the weight or jig-head off your bait, you can fish shads and similar lures in the same way as a wobbled bait. the only weight is the lure itself. What you’re trying to do this time, is mimic the action of an injured fish, perhaps with swim-bladder problems. A lot of folk go to a lot of bother trying to get unweighted shads to keep an even keel but I think that’s defeating the point. Fish with buoyancy problems can’t keep an even keel. That’s why they’re on the pike’s menu. Cast the lure, let it sink to the desired depth, again keeping a tight line and then start to add little glimmers of ‘life’. You’ve seen the last throws of life, when a fish is really struggling. That’s exactly what you want. Be vigilant when doing this as pike will often watch injured prey, just waiting for the perfect moment to launch their attack. Very often it’ll come right under your feet. I’m working on what I believe to be a completely new lure fishing method but that’s for another time.